Ross King is a Canadian historian, now living in England, who has brought to life certain periods of art history through the portraits of famous men. These include “Brunelleschi’s Dome,” “Michelangelo and the Pope’s Ceiling,” and “Defiant Spirits,” on the Group of Seven. The latest one is “Leonardo and the Last Supper” and it gives an exciting new account of the creation of this famous painting. Leonardo was born in Vinci, a small town near Florence. His father was a well-known notary, but the son preferred drawing, filling notebooks with sketches, including landscape which wasn’t much done in those days. He moved to Milan where his art teacher became Andrea del Verrocchio and he was soon doing work for the duke of Milan, Ludovico Sforza. The era included many famous artists: Donatello, Massaccio, Fra Angelica. Leonardo got plenty of commissions, many of which, including a huge bronze horse sculpture, he didn’t finish. 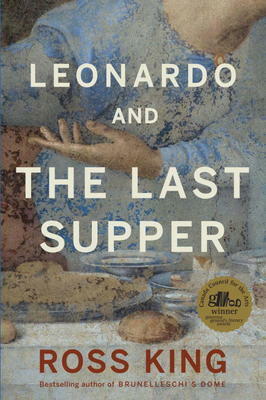 This book is full of photographs of his work, as well as the details of painting The Last Supper. Italy was at war with France with the result that funds for art work were often turned over to armaments. It is a fascinating period altogether and King has done wide research to bring it to life. There are not many lively books written about the aftermath of grief. Lisa Moore, the Newfoundland novelist, does this in February. The book is funny as well as touching. Helen is stood up in a bar one evening after joining a dating service. She is realistic about her need to be close to someone and frightened about gradually learning not to be. One reviewer writes: “You’ll be surprised at this novel’s ability to uplift.” The happy ending is convincing and, like the rest of the book, totally unsentimental. Lisa Moore won world prizes for an earlier novel, Alligator. She lives in St. John’s, Newfoundland and Labrador and writes short stories. This is a paperback edition of February which came out in 2009. 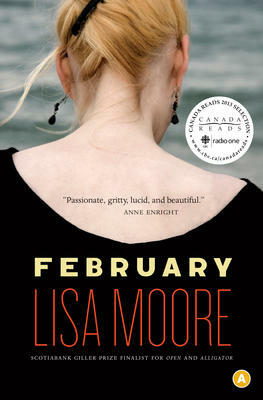 “February” was named the winner of Canada Reads 2013 on CBC radio.